I said I wasn’t going to write about it. But I have to. I. Have. To. On Wednesday evening, I was practicing my ritual of procrastinating by browsing through Instagram. A friend, an Essence editor, posted a new image of the first couple that will run in the upcoming October issue. The Obamas are on the cover. If you saw the picture, I know you saw … what everyone who saw the photo saw. All over social media, everyone's talking about first lady Michelle Obama’s, uh, surprise ending. Constantly. I want to be respectful of my FLOTUS. I do. I do not wish to objectify her. I will not. But it’s pointless to pretend not to see what we saw. And I'm making a public observation because, I mean, it stands out! It sits up! It cannot be missed. It’s the first thing everyone sees who looks at the image. Case in point: I showed the picture to my husband with no commentary. He laughed. Husband: That ain’t junk in the trunk. That’s luggage! Me: That. Is. The. First. Lady. Husband: She is a woman and I am a man with good vision. Husband: You don’t need 20-20 to see that, though. Like everyone, I've been looking at the first couple canoodle in photos for over eight years. They’re really into each other! And because I've been looking at—and loving on—them, I know well what they look like. Or I thought I did. This picture seems unlike the others before it. Is it the angle? The dress? Is Michelle Obama out of kitten heels and into stilettos? ’Cause as every woman knows, the right shoe can make a world of difference. Is this new? And not "new" as in purchased, but new as in, did FLOTUS start up an as-yet-to-be-revealed fitness plan that enhances what was genetically occurring already? Is it the same plan practiced by Serena Williams, Tracee Ellis Ross and Erykah Badu? Because there's a similar effect. And if there is indeed a plan, which is obviously working (very) well, what is that plan and when will it be released to the general public? I'm not asking for a friend. Or have things always been this way? Is it possible that we, the black people, missed this glory for eight years? I mean, we saw something. And that, too, was admirable. But this is a whole other level. We didn't see this. 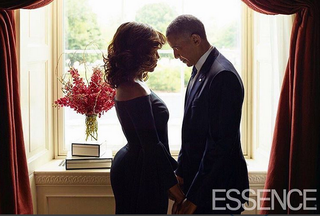 It was no secret that FLOTUS is curvy. I mean, how could it be? And her husband said as much in an interview for Time magazine, in case there were people who were completely unobservant. "The fact that [daughters Sasha and Malia have] got a tall, gorgeous mom who has some curves, and that their father appreciates [it], I think is helpful," he said. Sir. Understatement of the year. Maybe we were all distracted. I mean, there's a lot to gush over when it comes to Michelle Obama. She’s as brilliant as she is beautiful, as well-known for her elegance as for her side eye. Could it be that we were all so smitten by her all-around awesomeness—from declaring in inspirational speeches that "black girls rock" and encouraging our kids, and us, to "move,” to doing “Carpool Karaoke” with Missy Elliott on The Late Late Show With James Corden (and her vacays with Beyoncé)—that we missed … this? Were we so into her other wonderful physical attributes—the arms, the height, the bangs and all the other hairstyles, too—that we just didn’t notice? Or did she intentionally hide it from us? I heard from Jay Z that you can't tie a sweater over such parts for camouflage and they can't be hidden in pajamas. Did Michelle Obama do the impossible with all those fit-and-flare dresses she favors? If so, that's magic! But now the secret is out: FLOTUS is blessed and highly favored, even more so than we knew before. And we are blessed to have her as our first lady.